We all love the Raw Papaya Chutney that is served with Gujarati snacks like Kachori, Fafda and Gathiya. I tried a few recipes but did not get the right texture of this chutney. Then I did some changes to the recipe and finally got the texture and the taste that I was looking for. Two main ingredients in this chutney are Raw Papaya and Besan. 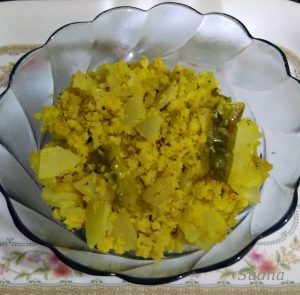 It is so tasty that you can also have it as Salad or as a subji along with Roti / Chapati (Indian Bread). 1. Make thin pieces of Papaya about 1 inch X 1 inch size. You can either peel Papaya before chopping or chop it along with the peel. 2. 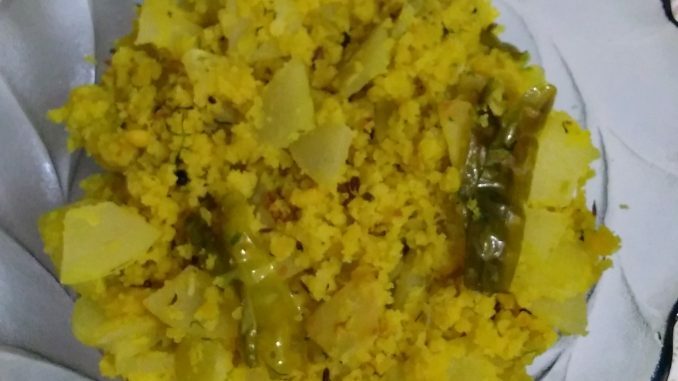 In a bowl, mix Besan, Buttermilk, a pinch of Turmeric powder, ½ teaspoon oil and salt. Make a batter like Idli batter / thicker than Pan Cake batter. Add water if required. 3. Add water to a steamer and bring it to boil. 4. Grease a plate with oil. 5. Add fruit salt to besan batter, mix it quickly in one direction and pour in the greased plate. Do not over mix. 6. Quickly Place the plate in the steamer and Steam for 20 minutes. 7. On cooling, crumble the steamed Besan. 8. In a pan, heat 1 tablespoon of oil. Add cumin seeds, a pinch of turmeric, Asafoetida, crushed ginger and slit green chillies. Sauté for 2-3 minutes. 9. Add Papaya pieces, mix and cook covered till Papaya is soft. Stir every 2-3 minutes. Do not overcook. 10. Add Crumbled besan, lemon juice, sugar and salt. Mix. 11. Tasty Raw Papaya Chutney is ready. 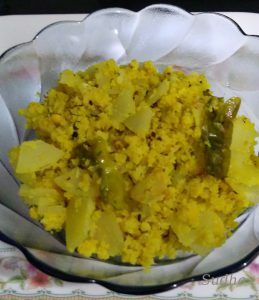 Serve it with Thepla or serve it as Salad or serve it as Subji along with Roti (Indian Bread).